Banks typically have 3% of their assets in cash in order to meet customer needs. 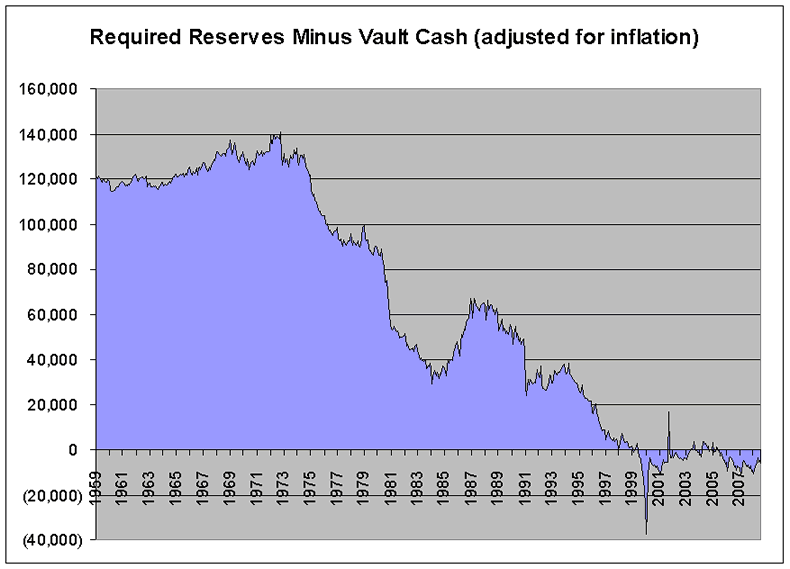 Since 1960, banks have been allowed to use this “vault cash” to satisfy their reserve requirements. Today, bank reserve requirements have fallen to the point where they are now exceeded by vault cash, which means lowering reserve requirements to zero would have virtually no impact on the banking system. US banks are already operating free of any reserve constraints. The graph below shows reserve requirements falling to zero over the last fifty years. Although, under current regulations, all depository institutions are required to maintain reserves against transaction (checking) deposits, the reality is they don't. The purpose of bank reserves is to absorb losses and add stability/liquidity to the financial system in times of crisis. 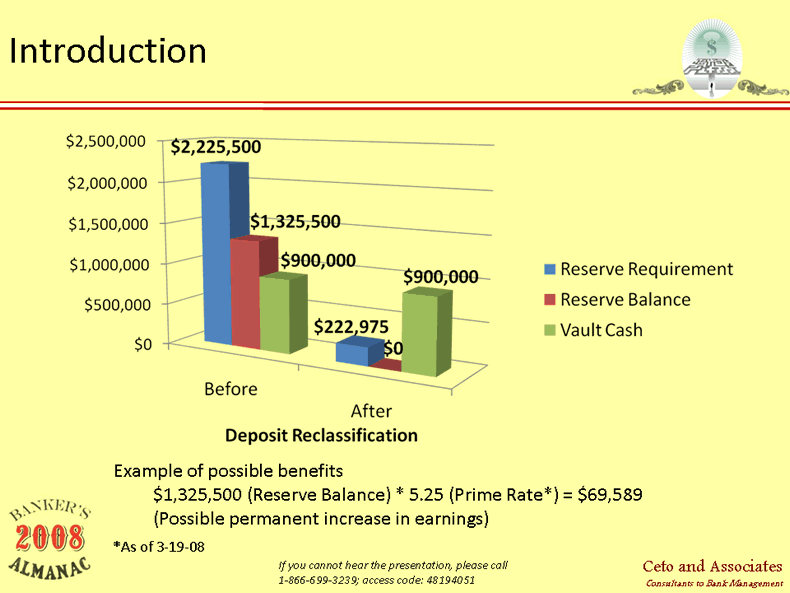 The “vault cash” banks use to satisfy reserve requirements is useless in absorbing losses because they are indispencable for banking operations (think ATM cash). The numbers used to create these charts come directly from the Federal Reserve. The image below shows where they can be found on the current Federal Reserve release . How did we get to the point where US banks are satisfying “reserve requirements” with ATM cash? In 1990, the reserve requirement on all nontransaction accounts (savings, CDs, money markets, etc…) was reduced to zero. Removing all reserve requirements on non-checking accounts has never happened before in over a hundred years. Meanwhile, the requirement on transaction deposits (checking accounts) is 10 percent, which is near the legal minimum. 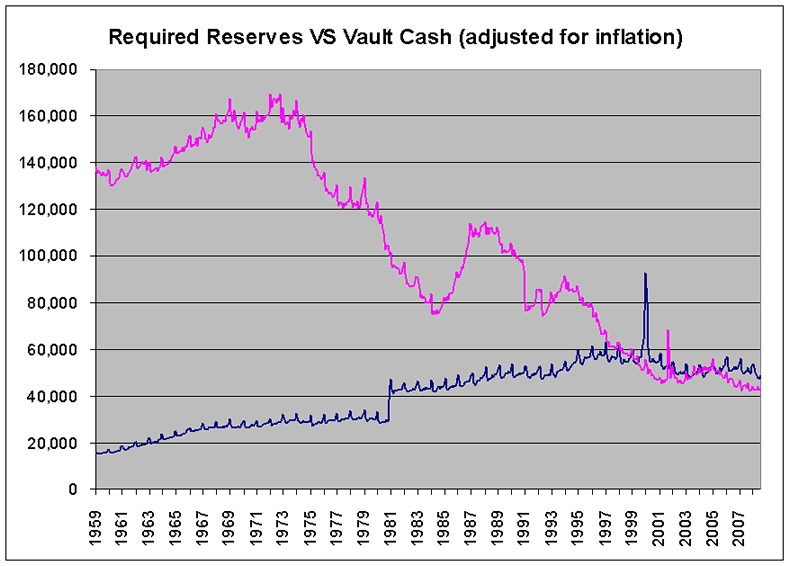 However, the lowering of reserve requirements by the fed doesn't explain how reserve requirement fell below “vault cash” (less than 3% of a banks assets). Something more was needed. For accounting purposes, all Citibank consumer checking accounts (Regular Checking, Citigold Interest Checking, Interest Checking and Basic Banking Account) consist of two sub-accounts ; a transaction sub-account to which all financial transactions are posted ; and a holding sub-account into which available balances above a pre-set level are transferred daily. Funds will be transferred to your transaction sub-account to meet your transactional needs. For Regular Checking and Basic Banking Account, both sub-accounts are non-interest bearing. For Citigold Interest Checking and Interest Checking, both sub-accounts pay the same interest rate. Both sub-accounts are treated as a single account for purposes of the client's deposits and withdrawals, access and information [ie: your statements] , tax reporting, fees, etc. JPMorgan, Bank of America, and the rest of the banking sector are also big users of deposit reclassification . Check the terms and conditions of your checking account. Odds are 99 percent that you too have one of these "two sub-accounts" Frankenstein monstrosities. In a banking system with no reserve requirements, everything becomes a systematic risk because financial institution do not any buffer to absorb losses. Even the failure of a small bank becomes enough to bring down the entire financial system. The Federal Reserve is completely aware and complicit in this scheme. In order for a bank to begin using deposit reclassification, it first has to obtain Federal Reserve's "no objection." So the Federal Reserve not only knows of the practice, but has also OKed every single deposit reclassification program . The FDIC is aware of the practice too. Below is an extract from the FDIC's Temporary Liquidity Guarantee Program Frequently Asked Questions which it explains that “swept”, “transferred”, and “reclassified” accounts are guaranteed. The FDIC's regulations include the following rule: “[I]n the case of funds swept from a noninterest-bearing transaction account to a noninterest-bearing savings deposit account, the FDIC will treat the swept funds as being in a noninterest-bearing transaction account.” This rule is based upon the premise that the sweep or reclassification of the funds for reserve purposes does not change the basic nature of the funds for other purposes. Thus, if the funds are guaranteed prior to the sweep, the funds should be guaranteed after the sweep. According to the fed, “the notion of and need for reserve requirements” has “all but vanished”, because the Federal Reserve stands ready "as a lender of last resort, capable of meeting the liquidity needs of the entire banking system.” Sigh… Did it ever occur to anyone at the fed that having to prop up “the entire banking system” with liquidity (as it is doing today) wasn't a good idea? There you go. The fed let reserve requirements become a joke to eliminate the unfair “tax” on depositories (ie: the banks now receiving trillions in taxpayer bailouts). It is SUCH a good thing that the fed was on the ball and had its priorities strait about protecting the American people.